This cruise ship wedding cakes flavor was chocolate, vanilla, and almond all filled with buttercream icing and covered with my hand made marshmallow fondant, yummy! 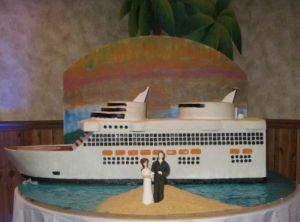 See how we made this cruise ship cake here! Have your cake designed to be the talk of the town and remembered forever! If we are ever booked up or if you want to get another quote for a wedding cake I highly recommend my good friend Heather from Custom Party Delights. 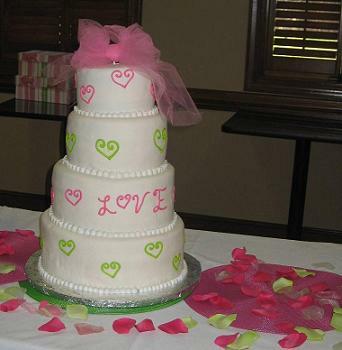 Take a look at some of the best wedding cakes in Raleigh here! This whimsical cake design was the inspiration of the bride to be, Velvet. Velvet and Justin are from Raleigh and planned a beautiful wedding at Bass Lake in Holly Springs, NC. They also invited me to stay and cut/serve the wedding cake! 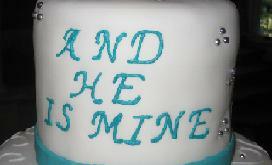 This grooms cake was made for the dinner rehearsal for the wedding of Brittany and Clay Torrence. 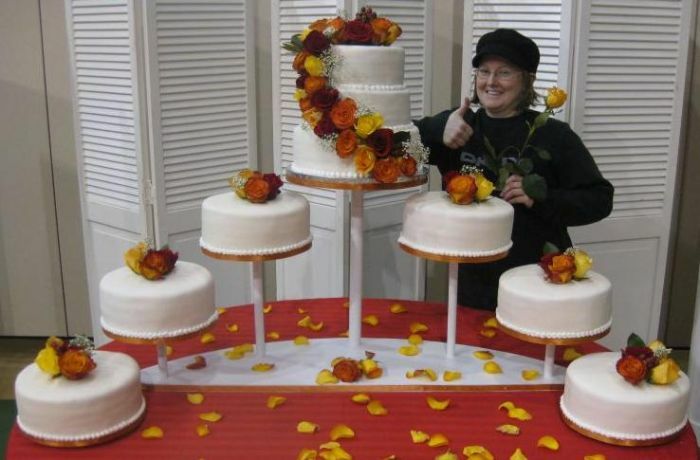 Our owner, Stephanie English takes a personal interest in each cake to provide a customer service standard unmatched in the wedding-cake industry. Her clients regularly provide cake reviews. Read our cake reviews here. We use the latest cake design software so you can see the cake of your dreams before it’s made. Matching the style of the bride and the look and feel of the occasion is one of the key ingredients in a successful cake design. Located in Raleigh, Piece A Cake delivers stunning wedding cakes to brides and grooms in Raleigh and the surrounding North Carolina areas. Piece A Cake has established a reputation for the best tasting, unique, and beautiful cakes in North Carolina. This colorful cake was for an outdoor wedding at the lake! Our wedding cakes are priced very competitively allowing even the most conservative budget to afford a beautiful and uniquely designed cake delicious! If you’re looking for a wedding cake in the Charlotte, NC area please visit my good friend Katie Blackwell-Martin at Katiebelles.Com. She has over 10 years experience and truly earned the title of executive pastry chef. See her work for some great cake ideas and I highly recommend Katie for your event. 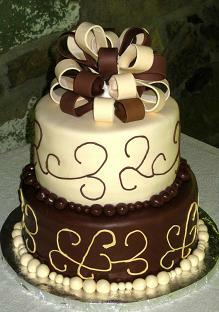 ”My fondant cake was gorgeous. Words cannot describe how incredibly thankful and grateful we are that you were apart of our special day. 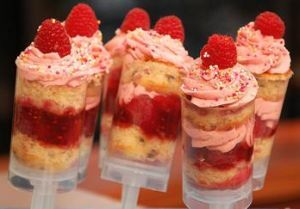 The mini cakes were out of this world and absolutely amazing looking and tasting cakes. We had Stephanie make mini cakes for the kids that were adorned with their initials to contrast with the brides cakes color theme. A tremendous hit during the reception! Again, outstanding in taste and appearance! You'll miss out if you don’t have Stephanie prepare you cakes! The marshmallow fondant was so good. Must taste to appreciate the experience! 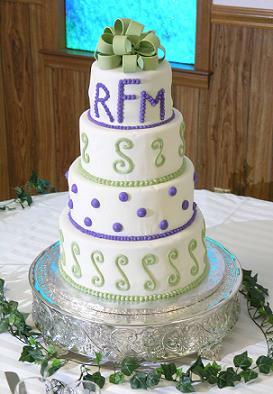 This fondant cake was ordered by Angela M. of Garner, NC. 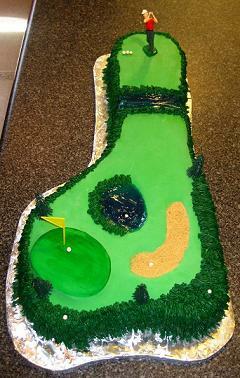 Angela e-mailed me a picture of a cake that she wanted me to recreate for her special day. The cake flavors were white with buttercream frosting, chocolate with buttercream frosting, and lemon with lemon mousse, yummy! The brown ribbon and brooch was provided by the bride. We decorated it with (non-edible) silver dragees and clear gems. 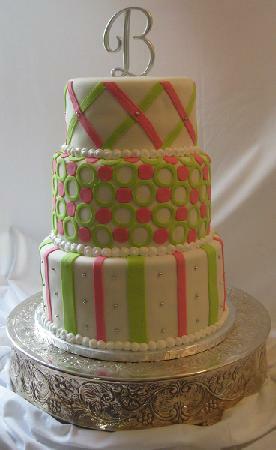 Deciding on your special cake makes a statement about your style and personality. 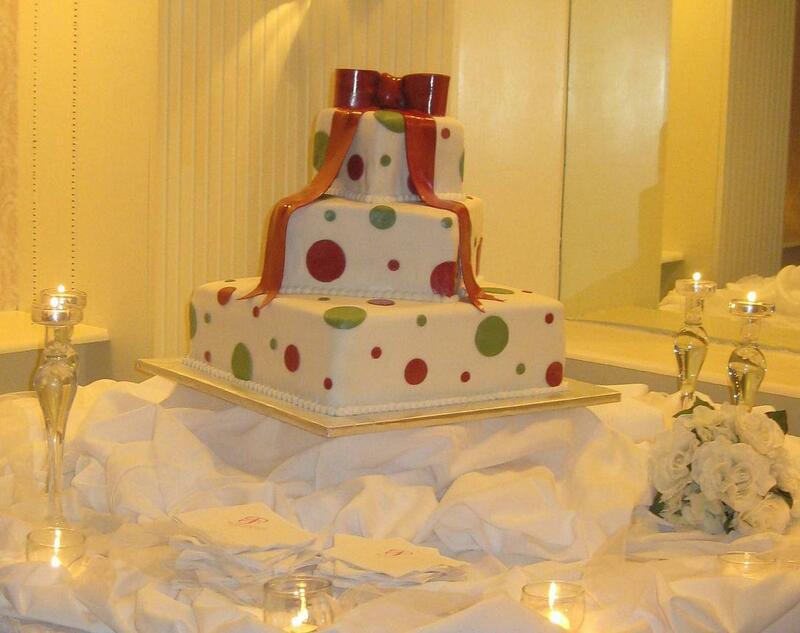 Whether you choose an elegant cake or whimsical style we will help you to design that perfect look that you desire. 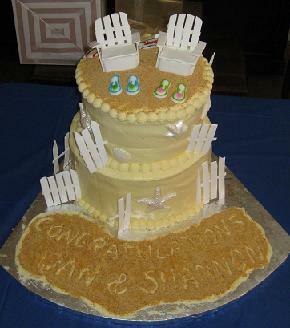 My most returning customer Kim U. of Raleigh, NC ordered this beach theme cake. Thank you Kim for all of your business! 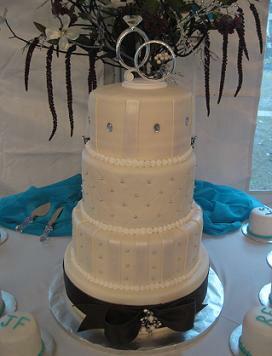 She was in charge of the cake for a party being held for a newlywed couple that was married on the beach. Herself, along with other friends, were throwing a cook out party in Dan and Shannon’s (newlyweds) honor. Get your surfboard and listen to the beach cake video hang 10! The beach theme cake flavor was marble with butter cream and raspberry filling covered in butter cream icing. The seashells were made from vanilla candy melts. The fencing and chairs were made from gum paste. The flip flops were sugar candy. Everything on this cake was edible. 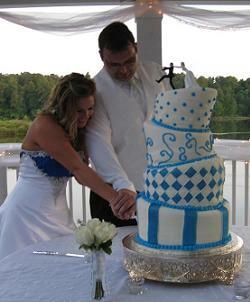 This wedding cake was made for Melissa R. and her Groom. Their wedding was held at the Marbles Kids Museum in downtown Raleigh, NC. Melissa designed the cake and what a wonderful job she did, I absolutely love it! The cake flavors bottom and top tiers were almond with butter cream icing and the 2 middle tiers were white cake with butter cream icing. 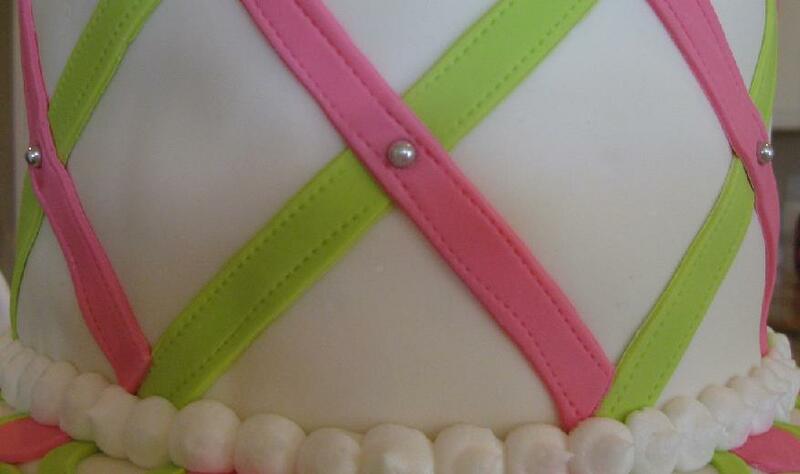 The cake was covered and decorated with our hand made marshmallow fondant. The bride and groom cake toppers were two PEZ candy dispensers. Melissa ordered them then she “bedazzled” them. Congrats you two! Hear the video and see why we call this cake "Da Bomb". This blue velvet cake was filled with cream cheese frosting/filling. Sarah wanted a very unique blue velvet cake. We used the red velvet recipe and substituted the red dye with blue. We hand make our icings, fillings and fondants fresh for each cake separately. 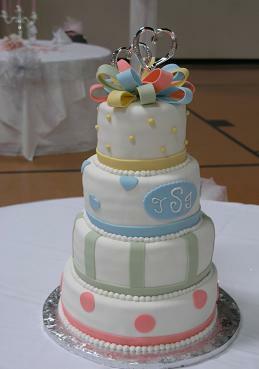 Additionally, each cake is baked fresh the day before your special occasion. Because we bake fresh, You will never taste the refrigerator in our cakes! The bride and groom are Sarah & Eddie Mack from Clayton, NC. The cake was very moist and delicious! 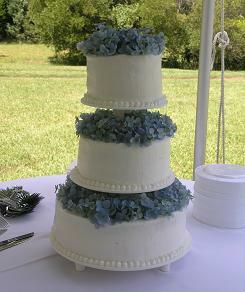 The flowers were beautiful blue hydrangeas and placed between the tiers and on top. You may ask how do we know it was delicious? When preparing the cake it is cut and trimmed to the shape desired and we get all of the cake leftovers! E-mail Steph to let her know your style and interest and make this part of your wedding a piece-a-cake! 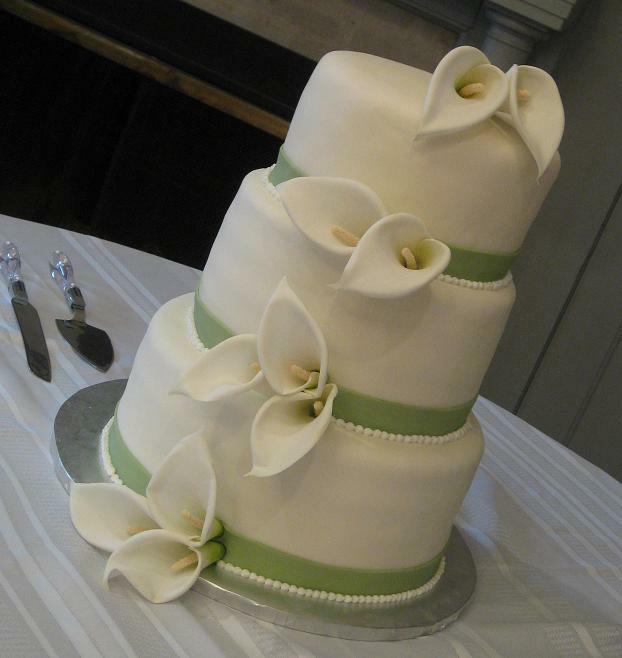 This beautiful stargazer lily wedding cake was made for a wonderful couple Carolyn and John who married in Knightdale, NC. 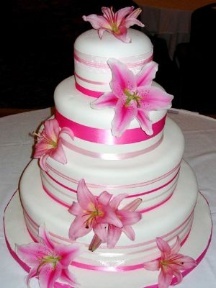 The cake flavors were strawberry and white with butter-cream icing covered with fondant highlighted with stargazer lilies. Best wishes to both of you to have a long and happy love together. Are you a bride to be looking for the perfect cake style? 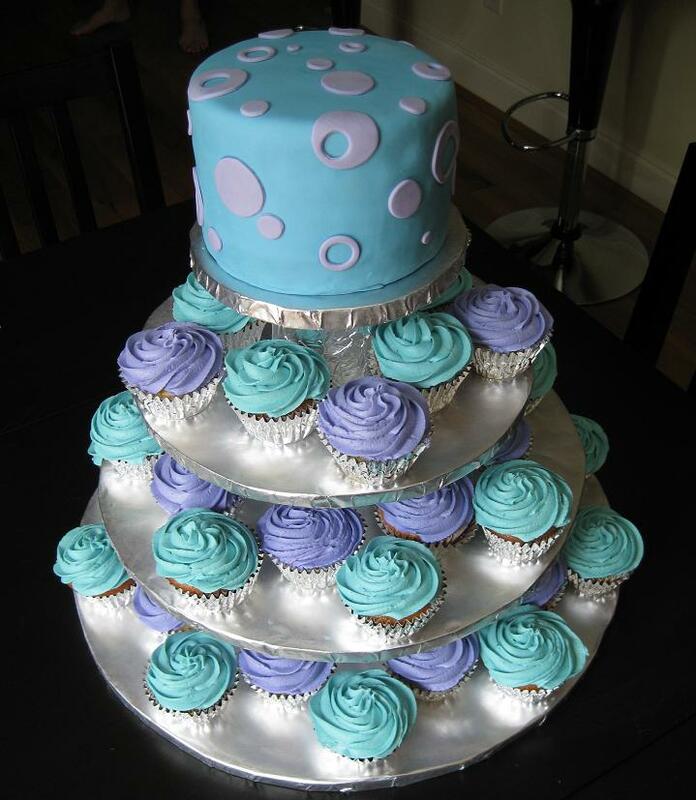 Visit my good friend Lorelie at Wedding-Cakes-For-You.Com for some great ideas and pictures of beautiful cakes. 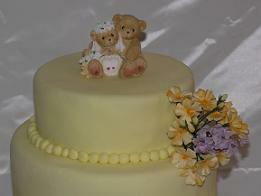 A loving mother for her daughter, Crystal, ordered this teddy bear cake for their wedding. They provided the cake topper and we made the cake to match. We lightly highlighted the cake with yellow and purple flowers. 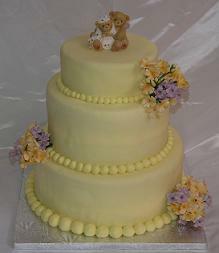 The teddy bear cake flavor was yellow with butter cream icing covered in light yellow marshmallow fondant. I think the cake was adorable and there is something to be said for keeping things simple. 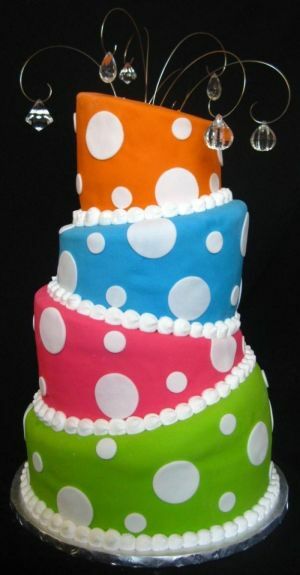 Sharon, from Raleigh, NC ordered this colorful wedding cake. She e-mailed me a picture of her dream wedding cake and we recreated it for her reception! The cake flavor was butter-cream delight with butter cream icing covered in marshmallow fondant. Looking for a great wedding photographer in Raleigh? Look no further. Visit Gina McLean Photography to see the best of what Raleigh has to offer in talent and experience. 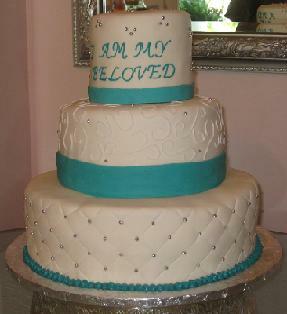 This cake with hearts was order at the last minute by the bride, Silvia V for her wedding. The lady that she had booked to make it had to back out do to personal reasons so she called me up and we got-er-done, whew! Each tier was a different flavor. They were white cake with butter cream & strawberry filling, the next one was white cake with Kailua and cream cheese icing, and the other one was white cake with butter cream icing. The entire cake was covered in marshmallow fondant. The hearts matched her invitations along with the colors of the wedding, topped with a chiffon bow. Steph's turning the cake world upside down with this chandelier cake. Yes it is all cake hanging upside down! Yikes! Cake bakeries in the Raleigh area displayed their cake art at the Visual Art Exchange exhibit in the Marriott on Saturday 2/07/2009. 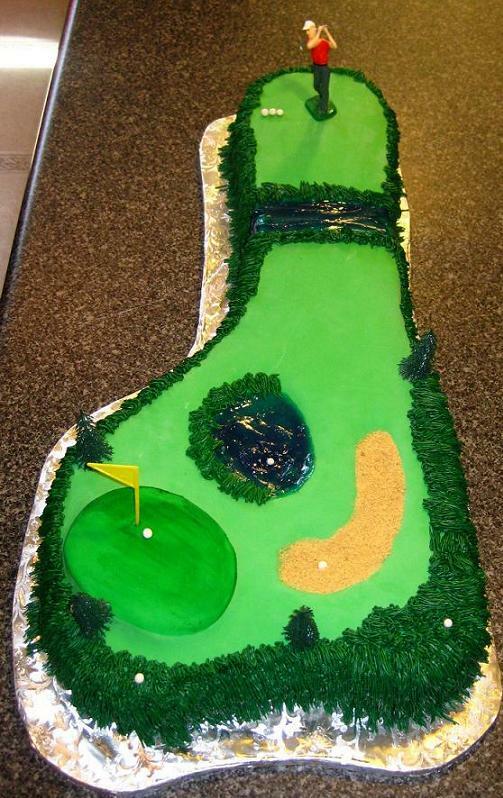 Great cake art! Visit their site and cast your vote for your favorite cake. This colorful cake was made for the wedding of Thomas and Jennifer of Fayetteville. I met them both for a cake tasting and consultation; we discussed the colors, design, and cake flavor. 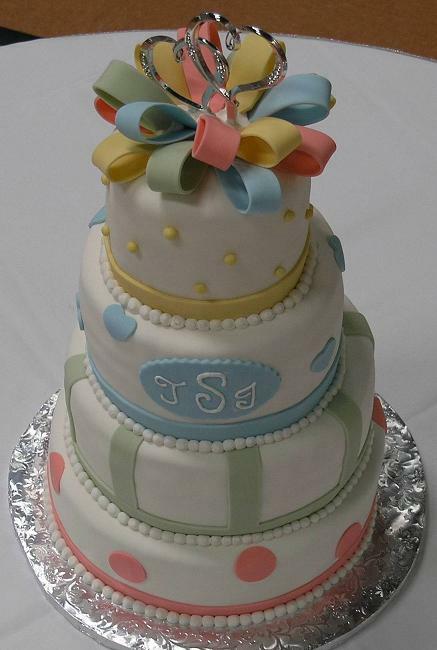 Jennifer had a picture of the cake that she liked but wanted to change the colors to match her spring colors. It turned out beautiful and I have to say her spring wedding-cake is one that I have put in my list of favorites. Don't forget the bridal shower cake. Both shared a piece a cake at their wedding cake cutting ceremony. 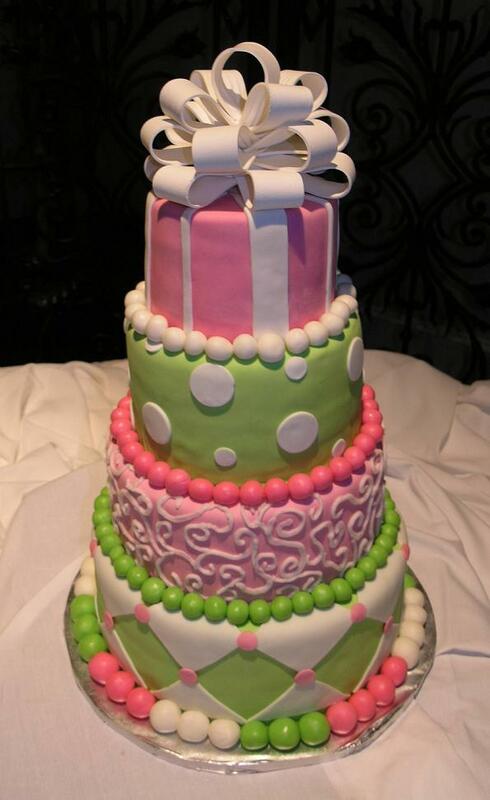 Don't you just love the colors of spring wedding cakes? "Congratulations to you both and I wish you years of happiness! 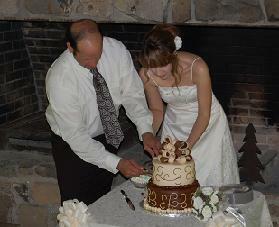 This chocolate fondant cake was made for Corey and Kim of Clayton, NC. The bottom tier is for the chocolate lover, Kim. It includes chocolate cake, chocolate butter cream and chocolate marshmallow fondant. The top tier was French vanilla cake with butter cream icing and a layer of raspberry filling, Corey’s pick, covered with ivory colored marshmallow fondant, and topped with a chocolate and ivory colored fondant bow. 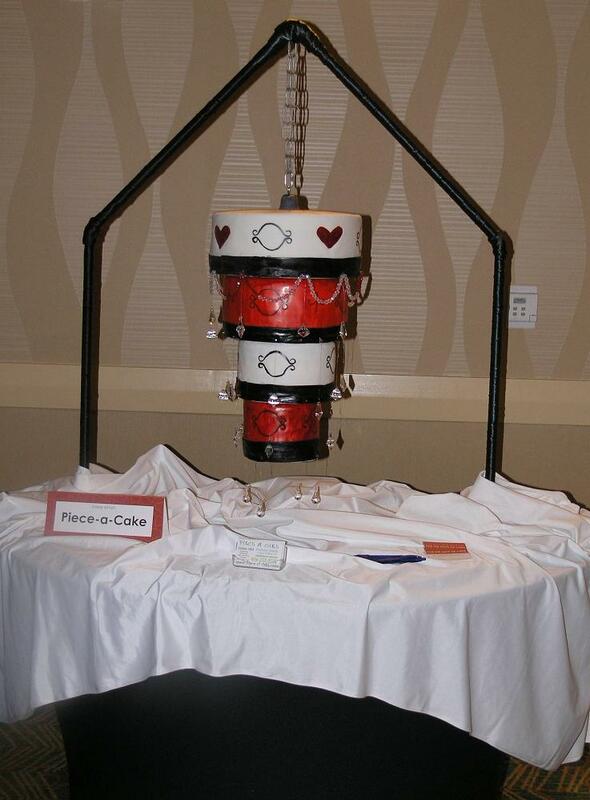 This 3 tier wedding cake was ordered by Charlee and Riley from Hawaii. 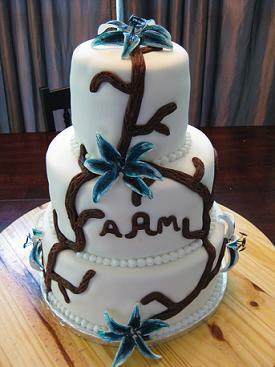 They lived in Hawaii when Charlee contacted me about designing their cake. We soon established a friendship on a personal level and not just business. Over several months we would send pics back and forth getting ideas. The week of the wedding Charlee and Riley came in for the finalization of the process which was to determine the cake flavors, and they were; bottom tier was white cake with raspberry filling, the middle tier marble with butter cream icing, and the top tier was white with raspberry filling. All 3 tiers were covered in marshmallow fondant. The little beads were silver dragees (non-edible) were placed on the center of the diamond style pattern, with the words “I Am My Beloved and He Is Mine” around the front and back of top tier. Congrats guys I look forward to more cake occasions with you and your family, you two are a wonderful, fun couple, God Bless, Stephanie. This country wedding cakes flavor was vanilla with raspberry filling, chocolate with chocolate buttercream, and yellow with buttercream filling. This country wedding cake was custom made just for Ariel and Meka (bride and groom) from Willow Springs, NC. 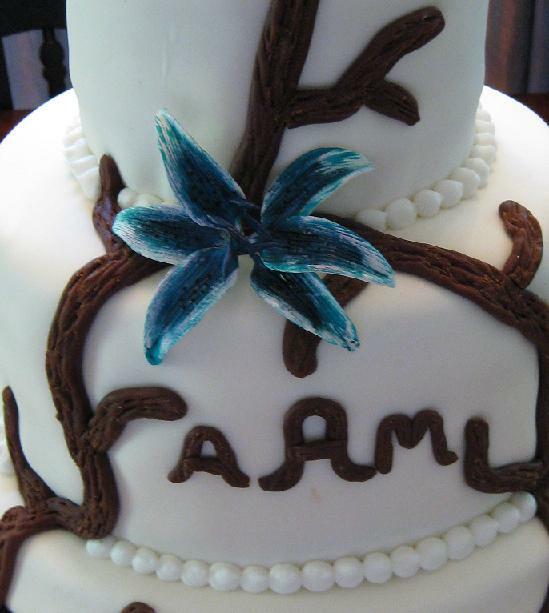 The stargazer lilies (edible flowers) were painted (edible paint) teal to match the wedding colors. 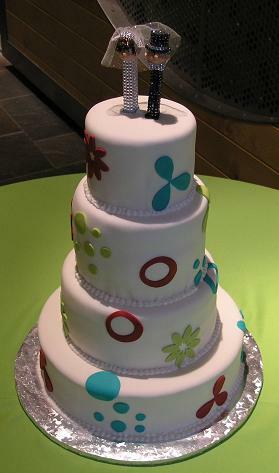 Maggie and Robby of Dunn, NC ordered this modern wedding cake. The cake flavor was carrot cake with cream cheese icing. All tiers were covered in our hand made marshmallow fondant and topped with a gumpaste bow. They also used one of our new large silver cake plateaus. A great resource for a wedding cake idea I recommend is Wedding-Ideas-Guide.Com. 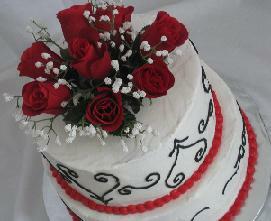 This site has great ides for your special day. ”OMG! Stephanie, the fondant wedding cake was BEAUTIFUL! My mother loved it! Next time I'm going to need your business cards because everyone wanted to know your information! Jaja in Henderson ordered this fondant cake for her mother. 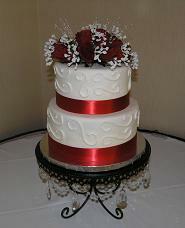 The cake was strawberry flavor with cream cheese icing and two tiers were butter flavor with cream cheese icing. Yummy! The fondant cake was covered and decorated with our hand made marshmallow fondant. 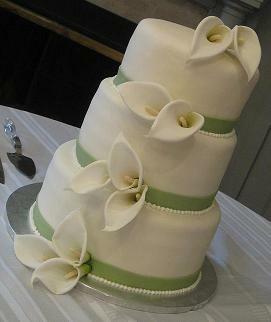 Calla lilies make beautiful wedding cake flowers. The flavors were white cake with cheesecake mousse filling and chocolate with butter cream filling all covered with delicious hand made marshmallow fondant. Yummy! A loving wife whose husband was coming home from Iraq ordered this small wedding cake. The two didn’t have a cake at their wedding because they were married just before he was shipped off to serve our country. She wanted to surprise him with a small cake on the day he arrived back home. 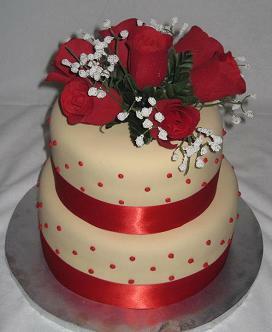 The cake flavor was vanilla with butter cream icing covered in marshmallow fondant and topped with red roses. I am so glad to have become a part of their story! This small wedding cakes topper was red roses. 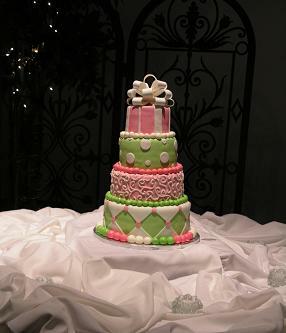 Cindy F. from Raleigh ordered this special cake for her daughter who was getting married and having a very small intimate ceremony in Virginia. Cindy sent me a picture of a cake that she wanted to duplicate as close as possible and make easy to travel with. This small wedding cakes flavors were chocolate with cheesecake mousse filling and vanilla with cheesecake mousse filling all covered in our hand made butter cream frosting. ”Steph, our cupcake wedding cake was wonderful! The cupcakes were a big hit with everyone. I received a lot of questions about where I ordered them. The wedding cupcakes were flavored yellow and vanilla with buttercream frosting. The top cake was yellow flavored with buttercream icing covered and decorated with hand made marshmallow fondant. 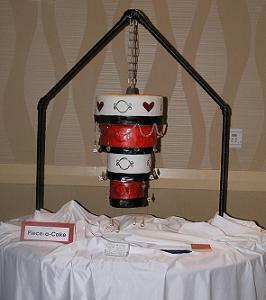 This pedestal wedding cake style serves 250 guests and was actually a graduation cake for Amber of Sanford, NC. It was so pretty; we had to put it on our wedding cake page. The cake flavors were marble with chocolate butter cream, Red velvet with cream cheese icing, and white with butter cream and raspberry filling. Yummy! The confetti roses were from Abagails Florist in Holly Springs. Amy went way out of her way to match exactly what we were looking for and I highly recommend them for any floral needs. ”Hey Stephanie, everyone loved the cake. The colors were perfect and it was so moist and delicious. It was the perfect centerpiece. Thanks again for everything!” Angela D. – Sanford, NC. 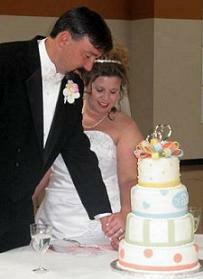 "Hey Stephanie, I just wanted to say thank you for my amazing wedding cake with circles. It tasted really good and looked perfect! I tried to find you when you delivered it but couldn't find you to say Thank You. In the future I will be using you again. Thank you." Amanda C. - Danville, VA. The cake was vanilla flavor with butter cream icing, yummy! Hand made marshmallow fondant was used for the circles that decorated the cake. Search for bridal magazines in North Carolina and bridal shows in North Carolina now!